← Outdoors in TX – The Opportunities Are Endless! Here at Texas Treats we are so thankful for the men and women who serve our fine country. While it may seem premature to start thinking about sending a piece of home to our troops overseas for Christmas, the deadline is quickly approaching! If you have a loved one serving in Afghanistan make sure that you have your Texas goody bag all lined up and ready to ship by December 3rd. The deadlines will shift for troops serving in other overseas locations but they are all likely sooner than you think! 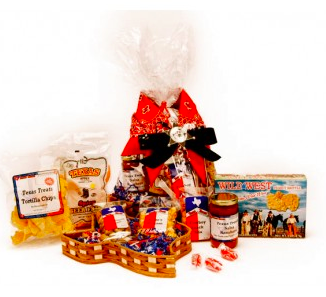 We know how hard it is for Texans to be outside of the warm embrace of the Lone Star State, which is why our gift baskets mean so much! We’ve got something for every type of tastebud. If your troop is partial to the weird and wonderful city of Austin, then our best-selling Austin Style Snackin’ Gift Basket is the perfect choice! You can even add a personal message of encouragement and we’ll tie it into the ribbons! If your loved one hankers for the flavor that brings them sweet memories of ranchin’ and ropin’ on the range, we’ve got the perfect combination of salty, sweet, and downright Texan. Topped with a red bandana and sheriff’s badge! Don’t forget, you can personalize the labels on your chips and salsa! Whatever tickles the fancy of your loved one, we want to bring them a little taste of Texas as a way of saying, “Thank ya!” for serving our nation and protecting all of the liberties that make the United States (and most of all, TEXAS!) such a wonderful place to call home. Howdy! We are a Texas-based company specializing in all things Texan! We have a wide variety of gift items, including food and personalized items, that you can view on our website or see in person at our Frisco store. Orders can be made online, on the phone, or in person at our store. We hope y'all like what you see and come back now, ya hear? This entry was posted in Christmas Baskets for Soldiers, Fall Gifts Texas Baskets Winter Holidays Thanksgiving, Fall Winter Texas Treats Gift Baskets, Gift Baskets, Gift Ideas For Soldiers, Gifts For Soldiers, Holiday Shopping, Military Daughter, Military Family, Military Son, Send love to a soldier, Soldier, soldier gifts, Texas, Texas Christmas, Texas Treats Gifts Fall Winter Holiday Christmas, Texas-themed gift ideas, Texas-themed gifts and tagged austin, basket, Fun, gift baskets, gift ideas, Gifts, gifts for soldiers, Texas, Texas gifts, Texas Theme, Texas Treats. Bookmark the permalink.